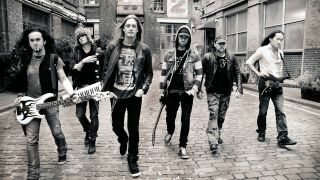 Dragonforce will release their Killer Elite - The Hits, The Highs, The Vids compilation on July 23. The 22-track collection spans two hours and 30 minutes, featuring studio and live material, and also includes promo clips on the deluxe edition. The artwork and tracklist can be viewed below. He says that the band have revamped their sound since singer Marc Hudson replaced their original frontman ZP Theart in 2011. Li adds: “Since Marc joined the band, we’ve actually released some of our speediest songs and some our most melodic compositions, too. The Killer Elite compilation can be pre-ordered via the band’s official website. Dragonforce are currently touring Europe.